This summer, IOU presents The Storytelling Bus, an ‘alternative’ history of Halifax, with the stories heard through headphones aboard its extraordinary Rear View bus, as it rides around town. The vehicle - a mobile auditorium - will be familiar to people having operated out of the Piece Hall in April last year. 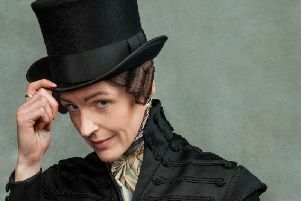 Its audiences were treated to a moving show that interwove a series of fictional reminiscences by an actress at a number of well known landmarks in the town. Now, in partnership with Square Chapel and The Piece Hall, The Storytelling Bus goes back on the road for eight weekends from May 25. Over 4,000 people will have an opportunity to experience it, with another 100,000 people seeing the spectacle as it travels around Halifax. And this time the stories will be true, gathered by IOU through its story map, from workshops run by Rear View writers Jemima Foxtrot and Cecilia Knapp and also from the eventual winner of this writing competition. lYour writing is an opportunity to explore memories, identify personal recollections in relation to a place and how it defined and influenced the moment. It could be something that seems insignificant but personally important, where the small moments became interesting - the ordinary was made extraordinary. The deadline is Friday, February 15.
lThe winner will be invited to the IOU studios and record their story for the Storytelling Bus. Their writing will be published in the Courier. They’ll get two complimentary tickets on the Storytelling Bus. And a complimentary meal and show for two at Square Chapel. Receive two complimentary tickets on the Storytelling Bus. lThird place will have their story published in the Halifax Courier. Two complimentary tickets on the Storytelling Bus. A complimentary meal and drinks for two at new restaurant The Trading Rooms, celebrating the very best of Yorkshire’s seasonal produce. Stories published in the Halifax Courier. And two complimentary tickets on the Storytelling Bus. The Storytelling Bus will run for eight weekends from May 25 to July 14; May 25-27 (Bank holiday); June 1-2; June 8-9; June 15-16; June 22-23; June29-30; July 6-7; July 13-14. Tickets available from Square Chapel Box office (01422 349422) this spring. Please note that anyone less than 11 years old and under 135cm will be required to use a booster seat (provided) on the bus.